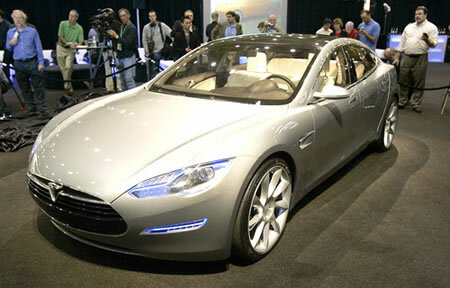 The Tesla Model S electric sedan was unveiled in California today. It can carry six adult passengers and will sell for $57,000. Vehicle sale will not begin until the third quarter of 2011. With production goals of 20,000 units per year, it will come with three battery options. The entry-level car will have a battery capable of a 160 mile range, while the sedan can be upgraded a 230-mile range battery or a 300-mile range battery. The basic model of the car will go from zero to 60 mph in 5.6 seconds, Tesla said, and in the second year of production, a "sport" model will come out capable of much faster times. "We're trying to accelerate the electric car revolution," Tesla chairman and chief executive Elon Musk said to an audience of about 100 journalists and film crews. "This is not a handmade car. It's not a derivative on an existing gasoline car." ...we feel that `Excelsior!' is indeed our motto. Take a look at a Tesla Model S video. From Tesla's Model S is here.